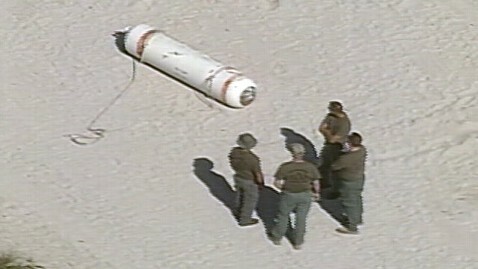 A military type cylinder washed ashore causing a beach evacuation, near 56th Street and Collins Avenue, Miami Beach, Fl., Dec. 5, 2011. Beach goers on Miami Beach got a scare today when they discovered what looked like a Navy mine that had washed ashore. That's exactly what it was, an inert Navy training mine known as an MK-57 that had likely separated from its anchor offshore. "There were no explosive components on the device," said Bill Dougherty, a spokesman for the Navy's Southeast region. Dougherty says beach goers did the right thing in staying away from the deice and contacting local authorities so they could determine what had washed ashore. Miami Beach Fire and Rescue evacuated the beach around 56 Street and Collins Avenue until investigators could determine whether the device posed a safety hazard. Dougherty said that once the device was identified as an inert training mine, a Navy team arrived to take it to a Navy facility in Fort Lauderdale. According to Dougherty, Florida has various offshore training areas that are used to help Navy personnel identify mines in the water. He says it's unclear how the mine ended up on the beach ,"we don't really know how it broke loose." The four- to five-foot-long devices are painted white with red stripes, which Dougherty says identifies them as training devices. Dougherty credited beach goers with doing the right thing in taking precautions around the device. "We give people the message that when they find something like that on the beach, step away from it," said Dougherty. "Contact the police and they'll contact us, and we'll send our experts to check it out and take appropriate action."